Xeester is extremely easy to handle and has an intuitive interface. When you first launch the app, Xeester is responsible for creating the database and for importing your existing hand histories. All automatically. 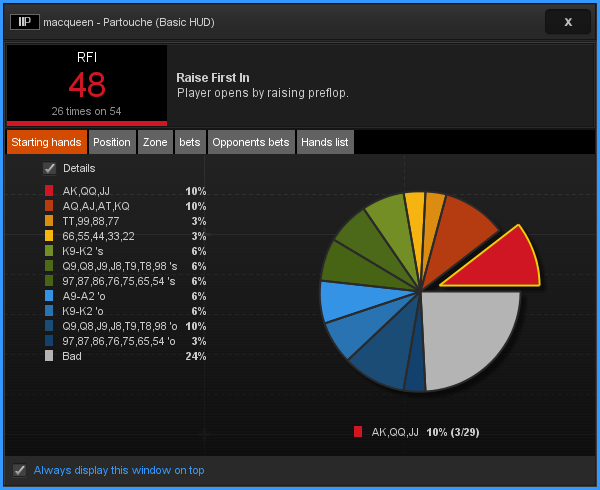 With a few clicks you can view your statistics, look at yours and your opponents results, review hands played in the hand replayer and share them on PokerStrategy.com or social networks like Facebook. 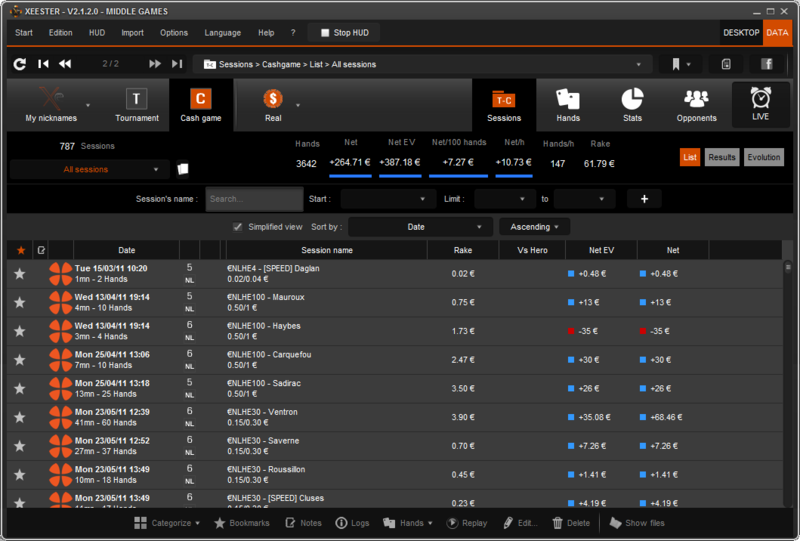 Xeester offers an intuitive and ergonomic layout for your data. When you play online, a graphical assistant (HUD or "Heads Up Display") indicates each player's key statistics in real time. You can customise the HUD with statistics and colours of your choice. HUD customisation: Customise any statistic to your preference. 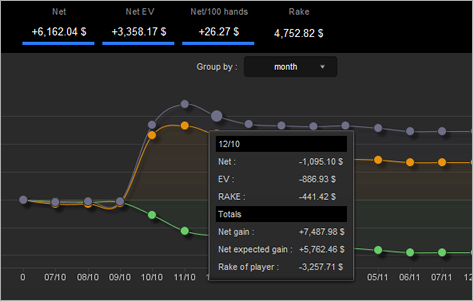 Categorisation: Assign colors automatically or manually to directly identify weak players at the tables. Badges: Create your own rules in order to automatically tag your opponents. 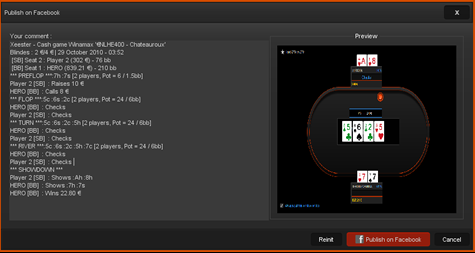 A simple double click on the HUD displays a player’s "Profile". It allows you to study your own playing style in depth as well as that of your opponents. You can access all the stats available on this player and any notes that you made. Right clicking on a statistic opens all the details you need, represented by clear graphs. Review and share your key moments! 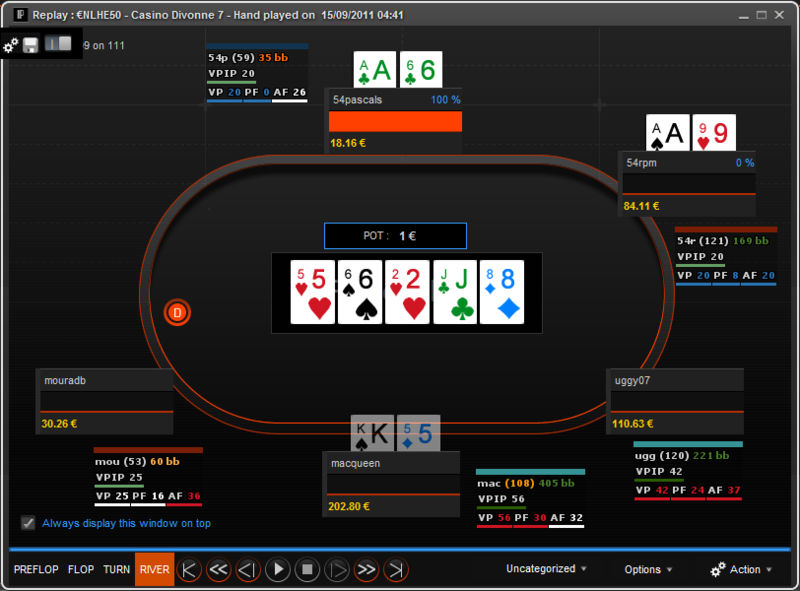 Xeester's replayer allows you to re-live your favourite hands. Want to share one? Xeester can export your replay, as well as any result or graph on Facebook! You can also easily export it in a JPG format.